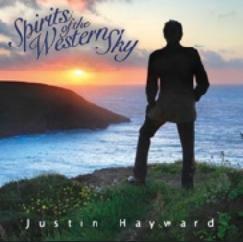 Moody Blues guitarist Justin Hayward ventures into solo territory for the fist time in 17 years with the Feb. 26 release of Spirits of the Western Sky. The writer of Nights In White Satin, Question, Tuesday Afternoon Your Wildest Dreams and several other Moody's classics recorded the new project in both Nashville and Genoa, Italy. The album reunites Hayward with orchestrator Anne Dudley, who he credits as, '...one of the true greats' of her field.' Also onboard but coincidentally was Kenny Loggins who sings with Justin on the song On The Road To Love, a tune the pair wrote after running into each other at a hotel while touring. With his band having recently announced that the Moody Blues have no future writing or recording plans, Western Sky could be as close to new Moody's music fans are likely to get.